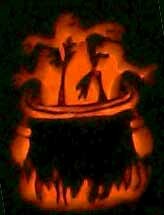 If you're not in the mood to sit for a few hours and carve, but you want a unique pumpkin, then check out the squinting pumpkin mentioned below. Otherwise keep reading. Be sure to take necessary safety precautions. First of all, you should get yourself some carving tools. The Pumpkin Masters website will tell you the basic steps to carving a pumpkin. And they also have pattern books that contain some nice designs. ...designs everyone else will be using. For a wonderful treat, check out Jay Ball's site PumpkinGlow.com for astoundingly beautiful patterns, professional carving techniques, and tips on making your own patterns. Or, download some from the pile of free patterns on StoneyKin.com. Another great site for tips and pre-made stencils is Ryan Wickstrand's site ZombiePumpkins.com! Alternatively, you can find similar tools by Pumpkin Party. While you can copyright an implementation, you can't copyright an idea. Select an unbruised pumpkin, the size doesn't matter - although bigger is better. You can always enlarge your pattern; shrinking a pattern can get impractical for detail work. Check for discoloration and soft spots. Pumpkins that are flat and don't roll work best. Look for pumpkins with a sturdy stem, this is the sign of a healthy pumpkin. Don't lift the pumpkin by the stem, this can damage the pumpkin and make it age faster. Check the bottom of the pumpkin to see if the base is damaged. Sometimes the bottom of the pumpkin is thin and can get punctured. Bad things can grow in your pumpkin. If the pumpking feels heavy and sloshy put it back. I once opened a pumpkin to find the insides had rotted and there was a slimey, smelly, liquid goo. 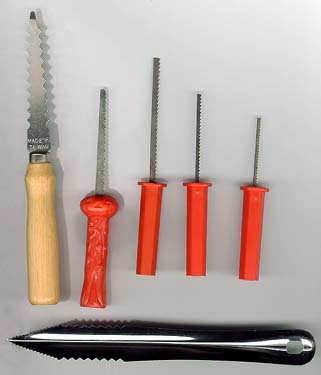 You need special pumpkin saws, drills, pokers, scrapers, knives, exact-o knives, pins or thumb tacs, and tape. Saws of differing length and teeth spacing determine how well they work for tight areas. Closer teeth and smaller length provide high detail. The width of a drill determines the size of the hole it makes. Your drill's length should be able to fully penetrate the pumpkin. 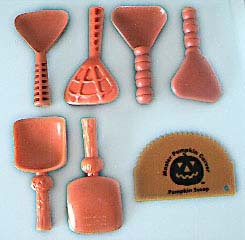 Scrapers are used to make the back wall of the pumpkin smooth. This is where the reflected light will be coming from. 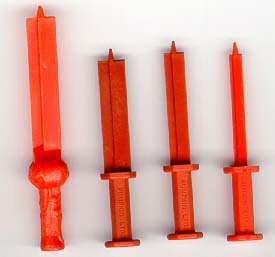 Pokers are used to transfer patterns onto the pumpkin as well as to make very small holes. You can also obtain watermellon carving kits, the tools vary slightly in design, but mostly you'll find scoops and different patterns. The most important tool is the mini hand held saw. Do not skip this step, no matter how much you are tempted to consider it too basic to read. Cut off the lid of the pumpkin, angling the edge of the saw or knife. This is the only time you will be making a cone-shaped wedge. You don't want the lid falling in. Keep the pumpkin steady and don't cut your hand, you'll need it later. Note, not all pumpkins have to have lids. If you intend to have a candle, be sure there is plenty of ventilation for the candle to breath, and consider not putting on the lid (which will scortch). Optionally, cut out the bottom or back (unless you're casting a projection) of the pumpkin to preserve the top. After gutting the pumpkin of all it's guck and seeds and strings, scrape it with a scraper. The wall for the front of the pumpkin should be no more than one inch thick. Anything more makes carving difficult. Don't make it too thin, or then thin areas will dry out and get wrinkled. See preservation tips to prevent shriveling. The wall for the back of the pumpkin should only be scraped thin if you are going to cast a shadow. In this case, scrape it down to half an inch thick. Read projection patterns are much smaller, and it helps if there is less pumpkin wall to cut into. Patterns for pumpkins are about as large as the face of the pumpkin. Anywhere that will be light on the final product should be cut away, in short, you're cutting out the negative. Patterns make high use of negative space. Obviously you can't have pieces floating, so everything has to connect to the wall of the pumpkin. Pumpkins can project images out the back and onto a flat surface. This effect looks really nice for indoor displays. The patterns need to be mirror image, that is flipped left-to-right, in order to project things like text on the wall correctly. Rear projection patterns need to be smaller than normal patterns and are typically no larger than four inches square. The pattern should be towards the top of the pumpkin's back, not centered like the frontal pattern. The light source should be below the cut pattern. This allows the light to project upwards onto the wall. If you see pictures, you can scan them and blow them up. If you see images on the web, you can enlarge them as well. alt.binary.clip-art typically has pumpkin patterns posted around October on the internet news groups. Having a high quality, original pattern will get your pumpkin noticed. As such companies that produce patterns consider the process a trade secret. But, we'll show you here how to make your own patterns by describing how they work and why, and then teach you how to convert photographs using Adobe Photoshop into amazingly detailed patterns like you see on television shows and movies! Tape the pattern to the pumpkin, you may need to put slits into the pattern so that you can fold a plane surface (the paper) around a sphere (the pumpkin). An alternative method is to stick some long hat pins into the pattern to hold it into place. Either do it along the pattern edge that you're supposed to cut, or do it in dead space (a block area that will be cut out). In bad lighting conditions you can use a poker and poke holes about one eighth of an inch apart along the pattern's design lines. The denser the holes are spaced, the easier it is to trace the pattern. Additionally, your saw will cut easier, just like it is easier to tear a piece of preforated paper. In superb lighting conditions, like you're sitting under a lamp, it is possible to use a thumb tac, push pin, needle, or pin to make very fine holes. If you use this method, it will be virtually impossible for people to detect how you transfered the pattern up close. You'll need to make a lot of punctures. Spreading flour, baking soda (not baking powder - it will fizz), corn starch, or ground chalk over the holes will make them stand out. Don't skimp on the time for transfering the pattern. A little extra work now will pay off greatly later. Use the poker to mark where larger holes should be drilled. Don't attempt to go all the way though the pumpkin surface. You are simply making guide lines for sawing later. You are marking the pumpkin skin. If you have some colored water, like food coloring, you can dip your needle or pin into it, and provide a little additional visual clues for cutting. If you need to, a dull pencil can mark the surface to show which holes should be connected. As you peel back your pattern, mark with a permanent marker or crayon the dead areas. These will serve as reference points. Some people advocate tracing the pattern with a pen, but I find this gives your carved pumpkin the appearance of black lip stick. In the dark, and far away, this won't matter as much, but it takes away from the carving's beauty when viewed in a lit area or up close. Instead, save the pattern and refer to it while carving. If you were careful about peeling it off, you should be able to hold it back up and align your reference points. A good way to make reference points are to drill any holes first. Hold the pumpkin firmly in your lap. Drill all holes first. Using an exact-o knife, remove any areas of skin where you which to preserve the pumpkin meat. Scrape well behind any areas where you want just mostly pumkin skin. Your saw is not a knife, don't cut with it. Saw. Your saw is not a edge trimmer. You wanted a stunning pumpkin, the investment is time. Follow the pattern edges carefully. It is better to make lots of little cuts than one big cut. If you hand gets tired, put the pumpkin down and take a break. A detailed pattern may take at least 4 hours to complete. Too much force can cause you to damage the pumpkin. It is vitally important to take your time. Be patient. Do not expect immediate results. Saw dot to dot. Hold the saw like a pencil. Push it in and out of the pumpkin flesh. The saw will cut its way through in its own. Don't force it. It is not a knife. Don't slice. Don't push. Should you damage a saw, use a pair of pilers to hold the end of the saw over a flame until the saw is very hot (30-60 seconds), then push it into the plastic saw handle. Don't breath the fumes. Don't push it all the way in, just about a quarter to half an inch. Let it cool off, or submerge it in water. If you feel sick, you breathed the fumes. If you burned yourself, you didn't use pliers. If you feel sick and burned yourself, that's natural selection at work and you might want to reconsider being in a room full of sharp objects. Rotate the pumpkin so that you are always carving at a 90 degree angle into the pumpkin. Your saw should always be perpendicular to the surface of the pumpkin, and it should always be on a line to the center of the pumpkin. Remove pieces of pumpkin parts with your fingers, not with the saw. Be sure the piece is completely free. If it won't come out, cut it into smaller subsections. Start at the center of the design and work outwards, each time you remove a piece of the design, the pumpkin gets weaker. Leave large pieces in until the end, so that your pumpkin's facial surface doesn't get weak while you're sawing other areas. Up close the pumpkin may not look as good or as smooth as you want. Wait until your pumpkin is lit and in the dark to make the final, granular corrections. Do not dig or spin the saws. Not only can this damage a saw, but it is not all that effective. The best way to repair a pumkin is not to mess it up in the first place. Make slow, careful, tiny saw movements. Leave plenty of connective tissue. Cut the small holes first. If something does fall off, put one or two toothpicks into the area that broke off, then carefully push it back into place. Slide the piece on in the direction of the toothpicks so the final alignment will be correct. Don't worry if it isn't perfect, from a distance, a lit pumpkin will be visually distracting. Put the pumpkin in a wash tub of cold water. If the pumpkin is carved, put the carved part face down. Let the pumpkin float, and let the insides fill with water. The pumpkin will absorb the water and become very firm. If you have fine detail work to do, you may want to let your pumpkin soak over night. This will firm up the pumpkin flesh and allow you to do intricate carving. For long term storage, put a thin amount of petroleum jelly on the exposed, sawed edges. This prevents water from getting out. If water gets out, your pumpkin will shrivel. Anytime your pumpkin shrivels, soak it in a bath of cold water for one to eight hours, longer is better. Over night doesn't hurt. Putting a little unscented Clorox bleach in the water will prevent your pumpkin from prematurely molding by killing off evil pumpkin germs. Use a plant mister to spray your pumpkin and keep it moist. If you put it in plastic wrap to hold the water in and place it in the refrigerator, not the freezer, you can keep the pumpkin looking good for a long, long time. Once you remove a wet pumpkin for display, you should immediately dry it off. This prevents mold from hanving a chance to grow. For professional quality photographs, you want to use an electric bulb in the pumpkin. A 40 watt, uncolored bulb on a electric cord works very well. Keep the bulb low or off to the side so that it illuminates the inside back wall of the pumpkin. Some people suggest using a simple seven watt bulb or two to three candles. I prefer the Tim Allen approach. It is important to scrape the back of the pumpkin to make a smooth surface so that no odd shadows are cast. With the pumpkin lit, ideally in a mostly darkened room, take a picture of the pumpkin without using a flash. 400 ASA speed film works well, you can use 200 ASA if you let the shutter stay open longer. For really good shots, mount the camera on a tripod and use a zoom lens. This will change the focal distance, bluring the background, but keeping the pumpkin sharp. Ideally, a completely black background works well. If you are trying to catch a rear projection, use a piece of dark, colored posterboard fold into thirds (with the center section acting as a screen and the flaps for support). If you've ever taken a picture with a light source behind someone and it turned out to have strong contrasts, this is exactly the effect we're trying to achive. You can put tissue paper behind the front face of the pumpkin, tacking it on with toothpicks to hold it in place. This creates a colored filter. Using different colors for different areas products a nice effect (red eyes, blue mouth, etc.). Try wax paper. This crates a more blury effect. Put tin foil on the rear wall of the pumpkin. This give a metalic effect. Becareful when using tinfoil around an electric light. Be careful using tinfoil around a flame -- it gets hot. You can light up your pumpkin with blinker bulbs. You can light up your pumpkin with flicker bulbs. You can use a black light in your pumpkin. You can put reflectors on your pumpkin. You can use LEDs to create mini lights on your pumpkin. You can put a noise sensor in your pumpkin to light or make sounds when someone approaches. You can put a speaker in your pumpkin and make it talk. You can put a microphone in or near your pumpkin to listen to the trick-or-treaters. You can use a flash bulb to create a startling effect. You can use fireworks to really create a pyrotechnic effect. You can use a strobe light to induce elapasy. You can use a fog machine to induce asmetha. For a real quick pumpkin carve, find a pumpkin that has a long stem. Put the pumpkin on its side, and see where it settles. Stare at the pumpkin, pretending the stem is a nose. The creases around the stem add character to the pumpkin as if it is squinting. Carve a mouth and eyes. Removing the skin and partially cutting exposes the pumpkin meat, allowing for teeth and whites of eyes. Beans and colored hat pins can be used for pupils.